I should solve all my puzzles at 4:30 a.m.! I shredded this thing. Fell asleep last night before the puzzle even came out, woke up at a ridiculously early hour, rolled out of bed, came in here to my home office, and took care of this puzzle in under 5 minutes. I kept waiting for it to tighten up, and it did, a bit, in a couple of places. But 1A: Toast often given with Manischewitz (L'CHAIM!) was a gimme, and I got most of the crosses right away, which meant I was out of that NW section with both MOT JUSTE and MUMBO JUMBO under my belt in well under a minutes. Needed only the "K" from KIBBLE to get KRUGMAN (7A: Nobel-winning economist who wrote "Fuzzy Math"), and then filled in Every Single Cross, in order, from RENOIR to NELL, without hesitation. 15D: Horror film antagonist surnamed Thorn might've been very hard, except by the time I looked at it, I had the DAMI- part already filled in. 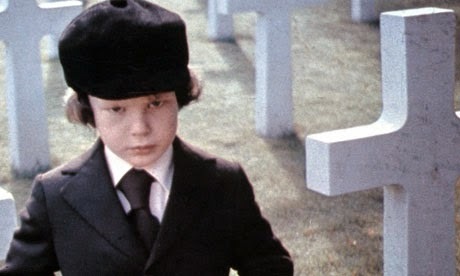 Only issue was how to spell DAMIEN (from "The Omen"). I went with "A" at first, but that was easily corrected. Eastern section went down just like the NE, 1-2-3 from the crosses on the longer answers, starting with ZAIRE (23D: 1971-97 nation name) and ending with YOST (28D: Royals manager Ned) (helps to be a baseball fan there, but Ned's name has appeared several times now, so probably best to try to commit it to memory now if you haven't already). First real resistance came on the other side of the grid, where I couldn't throw either long Across answer down. Ended up guessing KAYAKER at 35A: Olympian in a shell (SCULLER). But all I had to do was look at 29D: Devil dog's outfit: Abbr. to know that wouldn't work. Wrote in USMC, then NCAA, and then that section was done too. Hardest part for me was coming down out of there and into the SE. TOW ROPE was very hard to pick up from its "?" clue (43A: Line of tugboats? ), and 41D: Shop shelter was too vague for me to be able to see AWNING immediately. But AL PACINO was a ridiculous gimme (53A: Actor with the line "Say hello to my little friend! "), so even that section didn't take that long to piece together. Never heard of KEY TAGS. Thought the clue (59A: Accessories purchased just for openers?) referred to key chains with bottle openers on them, so I wrote in KEY TABS … not that that makes any sense, really, but that's what my brain wanted, so there. Error didn't remain in place long. And then there was the least scintillating, final part of the grid, the SE, and once I figured out that NASSER (60A: Big player in the Suez Crisis) was spelled with an "E" and not an "A," I was all done. I think I enjoyed this. It was all over so fast, I don't really know. Must've been smooth, else how would I have moved through it so quickly? Feels very choppy, with lots of short answers. Hard to believe a grid with so few long / marquee answers is only 68 words. I think the grid was solid and playful enough to make this a good Friday puzzle. Some problems in the NW (CETUS crossing ASYE) and SE (buncha crosswordese), but overall, this was enjoyable. Good Morning! Major insomnia! Up at 2:45 trying to read myself to sleep with Harlan Coben, that's not happening! Can't explain why, but I worked through this puzzle in 26 minutes, no errors or googles. Never heard of mot adjuste! My fastest Friday ever. Tricky, but doable. Learned a few things. That was quite a multi-layered conversation yesterday, with over a hundred comments. I do appreciate some nice things that were said about the free puzzles by my friends consortium, and hope that none of you will retract them after taking a look at Cyclops de Mayo. We'll be keeping a low profile for the next few days while focused on grading finals, but have a doozie all set to tell you about in parallel with next Friday's puzzle! Incredibly easy for a Friiday,Liked! Another puzzle I plowed right through. Liked it fine, except too many gimmies on a Friday for my taste. LCHAIM, YOST, SCULLER, ADOBE, IGLOO, DIETRITE, ALPACINO, all offered no resistance. Only problem I had was the KRUGMAN/UTO cross. That seems like a possible Natick, and Friday-ish. Nothing really stood out other than the new (for me) cluing of ANIL. Liked it, but now have a serious jones for a challenge. Easy for me too. Had oil before ART and struggled a bit with the spelling of DAMIEN @Rex but the rest went pretty smoothly. Stuff like MUMBO JUMBO, SHEER HELL, CATCH A COLD, NO HARM DONE...made this a fun solve. Plus, like Rex, the delightful AL PACINO clue opened up the SW for me. Liked it a lot. Not sure I've heard the term KEY TAG before so thanks for the WOTD POOP. One of these days NON U will sink in. At the end I was looking at _R_GMAN, _ITTLE, _TO. Fortunately KRUGMAN came to me. I am a dog person so "pet food" makes me think of dogs and I wasn't thinking of KITTEns. UTO was the familiar UTE as a comb. form. Wikipedia claims that Uto-Aztecan "is a Native American language family consisting of over 30 languages. Uto-Aztecan languages are found almost entirely in the Western United States and Mexico." Your puzzle offering yesterday was sort of a paradox. If the solver was not able to "finish" it then they finished it and if they "finish"ed it then they did not finish it. Here "finish" means that all answers were complete and the unquoted finish means that the puzzle was correct. Is this what you had in mind? Similar experience to Rex's. Fairly easy Friday with a few crunchy bits here and there. Enjoyed it! Hard puzzle for me but a good and fun puzzle. Why? The answer for perfect expression was 'mot juste' but I like GB Shaw's definition: "silence" and maybe I should have used it here. Yes, fairly easy, with the South a little harder. And here's my awning! Agree, this one was easy for a Friday. My solving experience was similar to @Rex's (including DAMIaN) albeit not at his speed. Unfortunately, my success may have been due to familiarity. I did indeed CATCHACOLD yesterday. Not exactly SHEERAGONY, but still...GRR. Not a fan of ENL or HES, but NOHARMDONE, as everything of 6+ letters is solid at worst, scintillating at best. Only major error was NOproblemo, which led to LosER. Anyone else do that? Thankfully, the SE was my last section, so the mistake became obvious quickly. Good stuff -- thanks, James. I always think of the Manischewitz with L'CHAIM pairing as a little dated and cliché bordering on stereotyping. Am I wrong? Having Nate Silver's foil, Paul KRUGMAN, in the puzzle amused me. For those who don't bother with FiveThirtyEight, there is an ongoing "war" between the two. Careful, though, if you are too literal you might believe there is actual antipathy there. ADZES? Slowed me down. I could not parse that clue. When I got the final cross (Z!) I had to stare for several seconds before I recognized the word. Still, any puzzle with 2 Z's can't be bad. If you missed my late comment last night, CBC did a nice piece on the use of DIES IRAE that many here will appreciate, I suspect. I thought it was medium challenging. 1:54. One google for MANET and one error at the Natick CAREEr/NOrU. I had to google for MANET, which cured [It may be a sacrifice] dUty and made USMC visible. (Devil dogs? Really? Ugh.) I've never heard of NOTU. I considered CAREEN then flipped a coin, as NOrU was equally obscure. CAREEN (ricochet randomly out of control) vs. CAREEr ( fly headlong randomly out of control) is a suble distinction. LCHAIM/MOTJUSTE was looking like a Vichy (French crossing French, and utterly betraying us solvers) for an hour. L_HAIn didn't mean anything to me. nOTJUST_ didn't either. Technically it isn't a Vichy as Hebrew crossing French deserves another name: a Dreyfus? You're welcome. I was pretty sure [Allure or Essence alternative] had to be a shampoo brand not a magazine.. I was thinking of Robert Shaw then GBShaw, not Arte, so CLARINET took the full 2 hours to drop. CETUS is new. MIRA is new. CULPA took way too long to see. IGLOO was very cleverly clued. SHEERAGONY for [Hell] was my 20th choice, but I got it off _HEER_____. Never heard of DIETRITE. NOHARMDONE was hard to see without MIRA, CULPE, CRONE and blue-sky guessing ANDERSON. SInce when are furies CRONES, anyway? No, this was not an easy puzzle. Even the misdirection had misdirection. But it was doable. Ultimately. With help. And errors. "Must've been smooth.... Feels very choppy...."
Been a weak week for those of us who enjoy a challenge. This one succumbed without much resistance. One problem was that I didn't want to believe some of the clunky entries for a Friday themeless, so I wasted a lot of time searching for cleaner fill. I am talking about things like ITSO, ATAN, LEADTO, ATMOST, NONU, OLEO, INUSE, ANIL, SIZEUP, ORELSE, UTO, and USMC|NCAA cheek by jowl in the west. GRR. I never heard or read HAMMY either. UTHER than that, NO HARM DONE. I liked many of the longer entries, none of them TOO HOT to handle. L'CHAIM and AL PACINO were Tuesday-level gimmes, and I loved the MUMBO-JUMBO / MOT JUSTE crossing at the J. 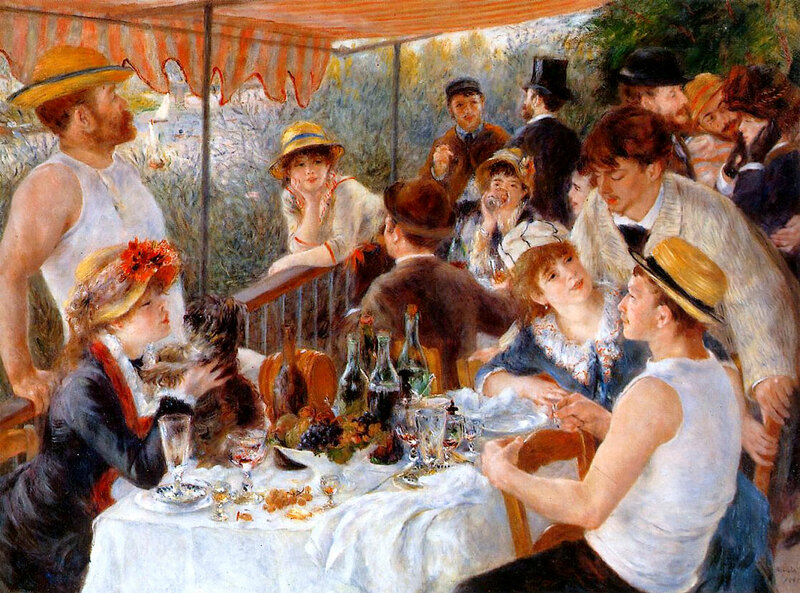 The RENOIR - MANET luncheons were great, as was the CETUS - MIRA cross reference. Lots of cool stuff. All in all, this TURNED OUT to be no SHEER AGONY. Quite the contrary, a bit too easy for my liking. My UNBEATEN streak continues. The Shaw/CLARINET clue/entry pair gave me tons of ideas, but for a change of pace, here is Artie Shaw playing his own CLARINET Concerto. So much for memory lane. Awfully easy, once you remembered that old GBS, like Woody Allen, had a sideline as a musician. h and w before AS YE, since the clue didn't tip off the King James translation, and vegA and lyRA before MIRA. Biggest problem was DIET coke. But everything was fairly crossed, so this was awfully easy. 9 Us - M&A should love it! Fairly easy Friday for us, and very enjoyable. Everything filled quickly except NW where we had to build LCHAIM letter by letter - looks like it was a gimme for most here. Also a near natick on the "N" in CAREENS, where we thought careers might have been acceptable - have no idea about NONU although I lived in London for three years, and watched "The Damned United" two nights back (it takes place in Leeds). 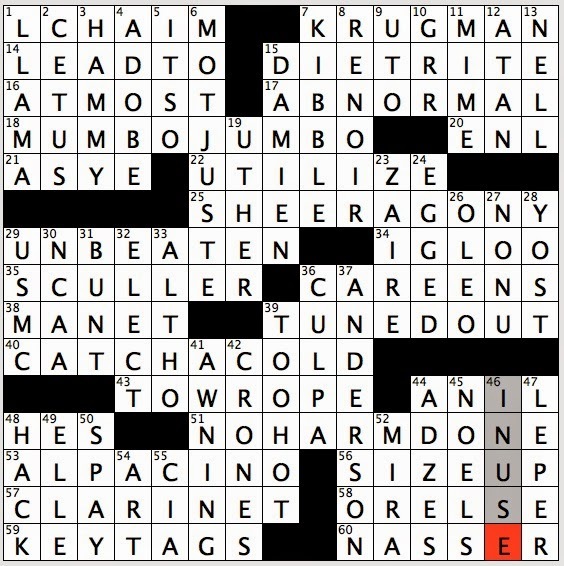 ADZES was tricky, nifty having KRUGMAN in a Times puzzle, loiked the clue for IGLOO. Have a friend in South Philly who has behind the desk in his office a wall size print from "Scarface" of Pacino in the bubble bath with cigar in hand. Overall, yeah, a fun Friday puzzle. Yep, this was easy but fun which is not often a word that describes a Friday. SHEERAGONY is usually more like it. That's a nice phrase along with MUMBOJUMBO, CATCHACOLD and NOHARMDONE. Only problem spots were KEYTAGS and MOTJUSTE but the crosses were easy. I liked including the ART of RENOIR and MANET. Well said @JTHurst. Silence is golden. 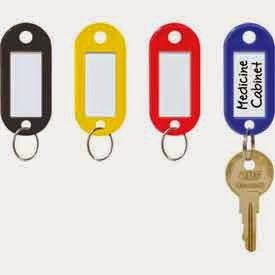 I had hoped for KEgTApS rather than KEY TAGS. That's my inner sophomore speaking. Groaning at Dreyfus @Casco Kid. I loved [Fix, as a pointer] for SPAY. I also thought it was easy, but DNF due to carelessness. I entered ASwE for the biblical 21A and never checked the cross. This was a 4AM insomnia solve that was an all too fleeting pleasure until I got to the southwest. Even staring at key tags and hes, I just couldn't make any sense out of them. Wasn't GBS also married to Betty Grable? Yowsa! Had to google 4, but got MJ/MJ so fast, I'll call it a wash.
Also call it easy-medium. Nicely done. Enjoyed this a lot, although it fell in a medium time (for a Friday). Loved watching MOTJUSTE emerge from the crosses, saying all the while "No way! Yes, way!" right into MUMBOJUMBO. Nice. Thanks, @jae, for parsing NON U for me, and thanks, @jberg for the link (BTW, lyRA before MIRA here). Speaking of Naticks, hand up for a personal Natick at the U (morning, M&A!) of KRUGMAN/UTO. got lucky. Guessed right. And speaking of Natick, I'll be in Needham next weekend -- puzzdaughter has been called as minister of the Needham UU congregation! 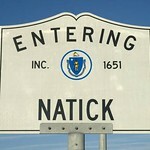 -- and will try to talk puzzhusband into a small detour (14 minutes) so I can see Natick for myself. Small pleasures. @Hartley70 Right! So how is [48A. Jackasses, e.g.] HES? Excellent review, JTHurst. Constructors please take note. So where's Friday's puzz? This one felt like a Monday or Tuesday to me....way too easy. I look forward to something to chew on, but this was clearly a meatless Friday! And it isn't even Lent! FUN happens... What a cool Friday! I was moving along quite well, until the SW corner - was thinking of the wrong Shaw, and didn't know that movie quote. This wasn't really an "easy" puzzle - just might seem that way for seasoned puzzlers. There was a "pushback" that requires experience to overcome - it's subtle. I was also wondering who was going to complain about Father Knows Best (37D) being another "aging Boomer" clue. @Kim Natick is about its Mall. Go to the Natick Mall. Oh, it will feel like any mall anywhere, but if you want to experience the unnoteworthy, unclue-able, prosaic sameness that is Natick, go to the mall. Also, and this gets back to @Rex's original coinage (7/6/08), be sure to see the west Natick train station aka Marathon Mile 8. [1A. Town at the eighth mile of the Boston Marathon] was BEQ's Sunday clue for which NATICK was the solution. Sadly, the cross 1D NCWYETH was born in neighboring Needham, not in Natick, thereby diluting the power of the reference, as @rex circa 2014 would hasten to underscore. No doubt NC frequented the Natick Mall himself on his dispirited, museless days. Congratulations to your daughter on her calling. I'm UU myself (so LCHAIM should have been a gimme!) and if Masked and Anonymous isn't, I'm sure s/he will "convert" at first opportunity. Easy and fun until the southern tier, then nuthin' for a while: I didn't know the AL PACINO line, and my timber-dressing AxmEn kept me from seeing NO HARM DONE. Eventually I figured out what a shop shelter was (had been imagining some cellar redoubt) and that broke things open. That MUMBO JUMBO - MOT JUSTE cross is really a treat. I also liked TOO HOT crossing COLD, the UNBEATEN SCULLER and being reminded of DIETRITE, elixer of my youth. @Maruchka - Thanks! I got that "jack" in jackasses made them boys, but didn't know/remember about Jennys. I was wondering if Jillasses fetched pails of water. @Casco Kid and @Kim Scudera - you didn't answer my question. Is it stereotyping? I am asking out of complete ignorance. @Casco Kid - I think NC was across and Natick was down. Particularly painful for me back then is that I knew NC was Andrew's dad and had been an illustrator and still didn't get it. @Evil - If he is rich would that make his concern about income inequality less valid? Less than 15 here (I don't think I could physically type all that in less than five!). I thought the puzzle was so-so; nothing stood out as good or bad. YOST, ALPACINO, ANDERSON, etc. around the corner blocks helped a lot. @Casco Kid - Nope - you're right on Natick being across and NC being down. Ah, memories. Me, too, for GBS; Artie finally came; I believe it was Ava he was married to, Grable was Harry James, the trumpeter. I agree that Krugman should be required to list what charities he has contributed to. DIETCOLA fell after GRR entered the picture. At first I thought the "perfect expression" clue might be a reference to the past tense, but MUMBO JUMBO cleared that up. Little NELL was the subject of Dickens' most maudlin death scene.am I the only one who entered AMA instead of CIA? I never saw the Pacino film, it got some harsh reviews, especially when compared to the (much) earlier classic. Nasser was a giveaway to this historian. L'CHAIM is a number in "Fiddler on the Roof," remember SHTETL? @Z; Manischewitz and L'CHAIM are both Jewish, but that's a fact - don't think it's stereotyping. Wednesday easy. My solve was eerily similar to Rex's except about half as fast. That still puts it with my fastest Fridays ever. NYT however has it not as easy as this blog seems to say. I actually got several answers by recalling previous puzzles and crosswordese, so perhaps the general NYT solver who reports his/her time is not as crossword-experienced as this crowd. Enjoyed it. Thanks, Mr. Mulhern. Enjoyed this easy-medium Friday. Some art, music and pop cultural references, some sports, some science, some Latin, some Hebrew, some French, some history/politics...something for everyone! Thanks, JM and WS. The last clue to fall was hell for SHEER AGONY, ironically! @Fred. So right you are. Got my pinups confused - and instruments, too. Ava and GBS? Wowsa! Good puzzle; played Medium for me, mostly because I had a total blind spot at 15 A. I am no diet soda fan; I want my full 2000 calories in every 12 oz. can, and even after I saw the complete answer, DIET RITE just didn't speak to me. Damien and UTO were a long time coming, but ultimately I finished correctly, no write-overs. Right up my alley - fastest Friday I can remember. Nonu was the last, never heard of it, but the crosses were plain enough. To JTHurst's excellent list - No "Hip" product names, no computer slang, no hip-hop slang. I didn't know the Al Pacino reference, but that didn't matter. A really nice, well constructed puzzle, that could appear in an anthology in ten years and still be enjoyable. Well done, Mr. Mulhern! Thought little friend quote may have come from The Treasure of Sierra Madre (sources of badges we don't need no…) or the Chito Bandito. I was wrong. The whole puzzle was kinda cute -- you know like your second cousin. Chuckle moment at 17A was thinking of Abby Normal's brain from Young Frankenstein. Found this mostly easy as well, except that I ground to a halt thanks to being completely unfamiliar with NON U and not remembering ANIL. I had NON_, and thinking NONU couldn't possibly mean anything, it blocked me from TUNED OUT for a while. ANIL slowed crosses for me in the SE as well. finished in about my average Friday time as a result. Enjoyed this one, with lots of good fill and clues. Particularly liked MUMBO JUMBO crossing MOT JUSTE, PACINO and his little friend, the clue for IGLOO, and NO HARM DONE. Had just the ER in SHEER AGONY and tried to put in "other people", despite no reference to Sartre. I would have loved it if that were the actual answer; it would have been a perfect Friday/Saturday subtle clue. @Mohair Sam: I thought "loiked" was just trying to be phonetic to fit with Leeds. And I loved "The Damned United". Great movie, and yet another case of Michael Sheen amazing with his versatility. I fell in love with Luncheon of the Boating Party at about 16. I had a giant poster of it over my bed in university. If I had to choose a picture to live in, that would be it. I'm the guy standing on the left, leaning on the railing. @oisk: you must know that I had that quote in mind; thanks. @steve j - Wish I'd thought of that excuse for "loiked", thanks for the lol. And yes, "United" is a great flick. And yes again on Michael Sheen's talent - one of the very best. @Z: Regarding L'CHAIM and Manischewitz: It may be cliché, but I think it's far from stereotyping. The former is a Hebrew expression; the latter is a maker of kosher products. While gentiles eat kosher foods too (and my German-Catholic grandparents' stash of Manischewitz bottles in the basement when I was a kid proved that some of them also drank kosher wine), the primary market is indeed Jewish people. No more stereotypical than using a bull-fighting ring or soccer to clue OLE. Distractions meant it took me some time to get going on this but once I could really work on it it unfolded nicely. I liked it. Technically speaking (OK, I'm nitpicking here) the stuff on a big spool in the marine store or the ship's chandlery is called ROPE. When you take it off the spool, cut a length and secure the ends, maybe put a loop in one end, it is thereafter called a LINE, not a ROPE. If it is designed for towing it is called a TOW LINE, not a TOW ROPE. So I resisted that one as long as I could. In fact the TOW LINES used by tugs, to tow barges for example, are usually metal cables, not rope at all. @georgebarany -- Wait. You already know what next Friday's puzzle is? @fred -- Hand up for AMA. So here's a puzzle with very few current cultural references -- and Rex liked it? Like Rex, I found the puzzle to be a lot of fun. A bit more challenging for me than he, because I didn't have as many automatic answers in my wheelhouse. Learned CETUS and MIRA. Did anyone here know MIRA? Is that a well known crossword answer? I liked this grid -- no spanners, but many answers with 6-10 letters. Easy-Med. I really liked this puzzle. MOTJUSTE was my favorite. ENL at 20a my least favorite; USMC is comprised of both enlisted and officers. Have to disagree -- this felt like a random trivia quiz dressed up as a puzzle. Regarding @Z's question: thanks, @SteveJ, for lending a hand on the connection between Manischewitz and the toast "L'chaim!" I don't think it's stereotyping to clue LCHAIM with a Manischewitz toast:the familiar kosherness of Manischewitz cues a Hebrew toast, leading us to LCHAIM. No more stereotypical IMO than "Toulouse toast" giving us "A votre sante'". Plus I'd swear that Manischewitz ran ads when I was growing up in NY that used the tag line "L'chaim! To life!" Anybody else remember this? Thanks, @CascoKid, for the tip on the Natick Mall, and the little fact about N. C. Wyeth -- I'll let my daughter know, if she doesn't know already! Three and out! Enjoy the weekend! Maneschewitz tastes great with Chinese food. The SW, because of KEYTAG and misinterpreting what "pointer" referred to, was the only resistance. I shared @Master Melvins concern about rope. There is only one rope on a boat, the bell rope. Everything else is a line. fave clue: "___ happens", answer length 4. Well, hello. second faviest clue: "Hell", length 10. First instinctive reaction: M&ARUNTPUZ. least fave fillin: NONU. [shudder]. Honrable mentionins to: MOTJUSTE (!?!) ... But, hey -- ___ happens... and those two weirdos each chipped another lil darlin into that thUmbsUp 9-U pot. Sweet. @r.alph: har. I understood yer question about as well as I usually understand @Q. (And **now** she's into foreign lingos. Had to fire up the Google Translate, dude.) Anyhoo, I was indeed goin for a runtparadox, but it was that you had to "-shun" part of the puz "in the end", in order to solve it. But, hey. De bustagut, mon amigo. NYT Submission Update: Haven't heard back from the Shortzmeister, yet. @Beezer: I hope U is readin this, since U ain't readin comments past yesterday. Cuz, there's yer paradox rodeo. "The Dandy Lion of Koan Heads"
It must have been an "easy" Friday because I finished quickly (for me) and accurately. Friday is often a DNF day--but not this time. Avoided the SHEER AGONY. "You can ignore the oft-repeated pedantry that 'there are no ropes aboard a vessel'". Fair winds, calm seas, smooth sailing, and a bottomless grog barrel to ye all. @Wreck - As one goes through life, one makes a choice: Stick to your guns with what you know or believe, or open your mind to additionial information. You seem to prefer the first. Yes, it's rope. On any decent boat, probably sisal rope. Absolutely everyone knew that, and no one really disputed it. Yet, above and beyond that, there's nautical custom, wherein there are no ropes on boats (excepting the bell rope), they are called lines. @Master Melvin and I pointed that out. We didn't call for a retraction from Will, just pointed out something, possibly interesting, possibly not, to those who were likely unaware of this fact. Feel free to continue to reject this knowledge, should it interfere with your life's path. My point is that it's a crossword puzzle meant to have "gray areas" and play on words -- that is the whole point! Maybe you should expand your mind a little and not have to have everything in strict black and white definitions. The puzzle was clued correctly and fairly - IMO. Hey, @Popeye. No need to be nasty!! @Wreck is someone who gives those of us who are not speed, or normally end of week, solvers a nice balance to those who blog everyday to exhibit their expertise. For me, this was a rare Friday finish so, obviously, EASY for most who come here. @Evil: I sense a naggin unfullfillment. A lingerin need for completion. A can't get no satisfaction. A this week was weak feelin of weejection, difficulty-wise, if U will. "Caring For Power Solvers Since 2014"
@M&A: Tricky one! Had ESSENE for 5 across, that hurt. Fell for the misdirect on 10 across and put OPOSSUM, but figured out that was wrong quick. Like the clues for 7 down and 13 across, chuckle-worthy. Also symmetry of .4 down and 12 across. About 3 and a half minutes, about 3 minutes of staring with only 8 across really to show for it, then it all fell at once. I wouldn't swear by it but the wine our minister pours during communion tastes a whole lot like Manischewitz. No 1 son is a Devil dog. I like that better than "jarhead"
Good, easy, puzzle - no complaints. I always have to pause at UTILIZ(s)E. My husband spells it with an S - well he's a NON U so I guess that splains it. Had Carter before NASSER but the awful looking ADZES took care of that. @M&A - 9:44 for me, no surprise. Agree with Benko in a way, really wanted 10 A to be WALLABY. We're on vacation in Maui and saw on the news that today is the 150th anniversary of Saint Damien of Molokai coming to Hawaii. St. Damien was the Catholic missionary who ministered to the people suffering from leprosy who were quarantined on the island of Molokai. He served there for fifteen years or so until he contracted the disease and died. Today's puzzle had the words LEPER and DAMIEN. Also SHEERAGONY. Like yesterday's, pretty easy but enjoyable. @ Lewis - didn't know MIRA as a star, although we have a golden retriever by that name. She is the niece of my avatar. The crosses for MIRA were easy, so no prob. Knew MIRA as a star- a movie star- as in Woody Allen's Mighty Aphrodite. Never saw it used as part of the Whale constellation. @questinia, Did Daedalus construct the labyrinths of your mind? I laughed for ten minutes visualizing one of those mega restaurants in Beijing with a bottle of Manischewitz on the 'lazy susan' of those 20-people, round tables with everyone toasting L'Chaim. @Benko, BobK., and r.alph: Thanx to U, M&A has a small but loyal runtpuz fan base. (Spousal remark: "they're only unwittingly encouragin you"). Sorry I misspelt "abrreviatedly", unintentionally usin the flatulent Italian version. As always, no refunds. But I digress. Back to today's professional, nonruntpuz event: this FriPuz had some real admirable fillins: KIBBLE crossin UTILIZE and SHEERAGONY. SIZEUP crossin LEPER. And appreciated both LLAMA and CETUS, as they were outright gimmes, which really helped M&A reconstruct a near correct rendition of LCHAIM. MUMBOJUMBO was killer good, too. My runty hat is ergo atip, and off, to the grid builder. Thanx for the fun workout. Come on back, any old time. Primo U-count, btw. M&A News Desk headline: California legislature to enact law requiring a "kill switch" on smartphones, to deter mushrooming theft problems. Dem. plan: Mashin the kill switch will disable phone, turnin it into a useless brick. So thief must now first kill phone owner, so that there switch can't ever get mashed. Rep. version: Mashin kill switch will detonate small thermo-nuclear device imbedded in phone, killin thief and nearby friends and relatives. One block radius. Teaparty version: same, but favors the 3-block radius option, just to make sure. "Digression in a Jugular Vein"
Man, the 4.30 shift is hell. Have a cup of tea, be busy, then go back to sleep! I object to the cluing of 7A. I myself knew that my name might fit and reading 7D made me even more nervous. 11D sealed it. For those who aren't in the know (ie, those who don't read my column), I ceased being an economist years ago, so this should have read "former economist". Today's column is proof of that. Every practicing economist still believes in consumer surplus, but I focus only on producer surplus these days. My current profession is more accurately described as "Knowledge Czar". LLAMAs who don't understand economics as well as they think they do flock to me and my speaking fees are higher than any economist could hope for. No one listens to economists, but (and here's the thing...) I am now the Donald Trump of the left - and I sound alot smarter than he does. DNF, and Googling didn't help, and, yes we who foolishly bought the NYT on Fri are still out there. For the bottom 100 solvers - very hard. Many repeat commenters here, so not as many perfect players as first thought, but a certain person needs enough rope to hang 'em. This was a well-made Monday puzzle. Nice job to the constructor (and thanks for keeping out proper nouns!!! ), but hideous job to the editor who assigned this to Friday. I did it on the subway, blew right through it without any challenges at all. There were some likeable twists in the definitions, but the problem is that even with the twists the answers were still immediately obvious once you got a letter or two. No thinking required! At most this was a Tuesday puzzle, but Friday? Who's idea was that???? Not easy by any means. And will someone kindly explain 48a? It took a helluva long time trying to figure out what ENL meant, vis-a-vis the USMC; then it hit: ENListed. The Marines do not draft. And speaking of hell, what a clue for SHEERAGONY! A description of what goes on there, I guess, but hardly a definition. No flag, but a warning; you are right on the edge, clue-wise. Watch it. No problem with the clue for 3d, but I wish it had been "'Over the Hedge's' carefree squirrel." Agreed that there are no "ropes" on boats, ropes though they be. They're lines. This took me just over an hour, thanks in part to my take on "Fix, as a pointer:" SPot. Oh. THAT kind of "fix." THAT kind of pointer. Named, perhaps, Spot. And what in the world are KEYTAGS? I don't buy OFL's attempt at an explanation. I've never heard of a "KEYTAG," so here comes the laundry. FLAG, for a non-thing! Struggled through most of this, so many names I only vaguely knew, and had to accept MOTJUSTE as something that "sounded right", but in the end could not finish the SW. Got the actor and the musician, but HES and KEYTAGS defeated me. My "opener" was someplace one would wear a nameTAG, and I just blanked on any other meaning. Some days are like that! "It was over too quickly".....wait for it....thats what she said. "It was all over so fast"......wait for it....thats what she said. It took almost no time at all (in syndi-time terms, of course, and relative to my own usually agonizingly slow pace)to reduce the grid to one blank square - CAREENS or CAREErS, I wonder and the cross was no help at all. In the end I chose correctly, but I hate having to guess between two plausible answers. @spacy - if I remember the earlier comments correctly, a "Jackass" is the male and a "Jennie" is the female of the species, so HES is pretty literal. Ropes on boats is OK. If they are running rig, they are sheets. otherwise ropes or lines works unless there's a specific name, I.e. Painter, which on large ships are usually called docking lines. Confused? Am I the only one to cross the early Teutonic version of Hades, shaeragony with the first name of Damean Thorne? Not easy for me: I feel dumb! Probably enough discussion about nautical ropes, lines, painters, etc., however, I doubt there is a tug boat anywhere that pulls other floating things using a TOWROPE. They use cable, anywhere from 1.5" to 3" thick. I think this fripuz had its share of misleading clues, but overall, NOHARMDONE. Cringe to see HACK and SPAY so close to each other and ADZES nearby. My capcha: 1637. Ah, the year Cardinal Richelieu of France created the table knife. See, he did do something good.